Welcome to the first issue of the sketchvideos.com.au monthly newsletter. 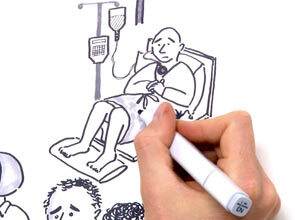 You're receiving this because you've made use of—or inquired about—our whiteboard animation or illustration services. We're based in Melbourne, Australia. In each newsletter, you'll receive a few interesting links and tips for improving your visual communications, as well as updates with what's happening with us. If you'd rather opt out, that's cool—no hard feelings. We hope you enjoy this first issue. We created this video to raise money for our entry in the Ride To Conquer Cancer, a 200 km charity bike ride that supports the Peter Mac Cancer Research Centre. We ended up raising over $15,000, an achievement of which we're extremely proud. Check it out. We don't just create sketch videos—we also teach others how to sketch as well, for work or play. Come along to this unique full-day workshop on Monday, June 15, to learn how to supercharge your sketching skills. "Just wanted to say how much I enjoyed your sketchnoting class the other day. I got so much out of it, and loved the simple techniques you taught us. It’s been so long since I have done anything so remotely creative, and it was just such a refreshing change." We're not the only company making a splash with our whiteboard markers. Here's a list of the sketch videos from around the web that caught our eye this week. That's all for this issue. Until next month, stay sketchy!